Stay ahead of the game and apply for a Summer Program! Not only do colleges look at your grades, they really look at the extracurricular activities you participate in. It looks fantastic on college applications if you apply for and participate in challenging summer programs! Summer programs are a great way to learn more about specific careers/fields, get to know students from other schools, and have fun! The Institutes at Georgetown University offer high school students an eight-day immersion into one of five subject areas. Here, you will have the opportunity to explore what interests you in an accelerated, hands-on environment while experiencing campus life and the excitement of Washington, DC. Train in a hands-on laboratory setting in the Georgetown Medical Center and get a snapshot of the first year medical student's curriculum. Work with Georgetown medical students, physicians and professors while focusing on some of today's most salient medical issues. Get a snapshot of the judiciary system through examining complex issues facing America's legal institutions today. Learn from experts in the science fields, research, and experience hands-on activities in laboratories, and on-site visits to government agencies as well as Capitol Hill. Explore the interworking of the political systems in the United States. Be a witness to history and see democracy in action. Learn more about becoming a leader in the sports industry and in business. Surround yourself with experts who will help you better grow and develop your leadership, journalistic or creative writing skills. Get your first taste of college life at an Ivy League Institution! Our programs are built around courses taught by Penn faculty, scholars, and distinguished outside experts. With small class sizes you can be sure to get the individualized attention you deserve. Summer Academies are academically intensive, non-credit programs for high school students. Residential and commuter options available. This camp will show you what's really involved and gives you an understanding of what Forensic Science is all about. CSI Camp is typically held towards the end of June each year and is open to high school sophomores, juniors and seniors. Students will stay on campus for the duration of the camp. Meals will be provided by the University. Students are given the opportunity to use deductive reasoning and scientific skills to uncover and explore the mystery of a series of unsolved crimes using current forensic techniques. This one-of-a-kind experience allows students to participate in the practical use of biology, chemistry and mathematics to examine evidence left behind at the crime scene and attempt to identify the suspect. Campers also have the opportunity to interact with scientists and investigators involved with forensic science and criminal justice as they further explore their academic future and career opportunities. The camp is directed by faculty in the University’s forensic science, biology and chemistry departments. 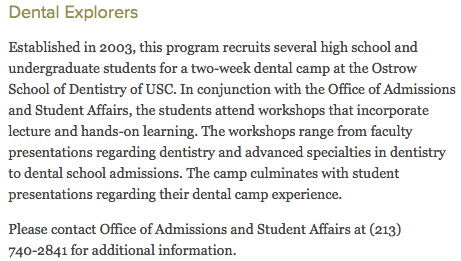 This is a highly structured camp and faculty members are with students at all times during their stay on campus. For more information, contact Phil Lucas, assistant professor of criminal justice and forensic science, at lucasp@findlay.edu. Click here to be redirected to the webstie. 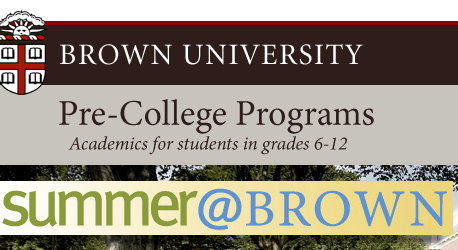 Brown Summer High School is a daytime program, and is open to Providence-area high school students. Brown Summer High School (BSHS) challenges local students to engage their minds in tackling big questions. BSHS students become active participants in the learning experience, and develop essential skills in reading, writing, speaking, and critical thinking. We seek students like you...ready to act, build, share, and create! The Center for Applied Molecular Medicine (CAMM) and the Westside Cancer Center (WCC) offer a unique program to promote scientific achievement for upper class high school students interested in clinical or research oncology. We believe that passion, coupled to outstanding aptitude, are the hallmarks for success. This program attempts to further scientific education by incorporating hands-on experimentation in a collaborative environment. The CAMM Jr. Fellows are presented with one challenge – how to determine which drug is bested suited (most effective) for their mock patient. During this process, the Fellows will become familiar with one of the most important aspects of medicine which currently confronts clinical and research oncologists. Resolution of this challenge will require integration of science, mathematics, and technology. The endpoint is a discussion of their findings with Dr. David Agus. Scroll to the bottom of this page to access the application. As Urban TxT strives to create a culture of technology leaders in South Los Angeles, where access to technology is extremely limited. Our summer academy has been successful in starting a community of technology pioneers, who are addressing social issues through the creation of Web Apps. We bring together middle schools, high schools, churches, tech startups, hackerspaces, and universities to help us develop a strong innovative community of inner city Tech Pioneers . For our summer program, youth (7th-11th graders) are emerged in an intensive high tech curriculum. Over fifteen weeks in the Computer Programing Academy students plan, design, and develop their web apps. We culminate with a Demo Day open to the local community, where students present their projects to judges. Following the conclusion of the summer program students take part in a Stanford College Tour, visit Silicon Valley and the Google Headquarters in Mountain View. This 4 week summer day-camp exposes rising sophomores and juniors to the creative nature of engineering through project-based activities and team challenges. Campers will experience working in HSSEAS’ state of the art Creativity Center along-side hand selected UCLA engineering student mentors under the direction of UCLA faculty and program staff. Take your understanding of engineering to a new level at Tech Camp. Ignite your drive to explore and innovate through hands-on building projects. Learn about the many opportunities and pathways at the UCLA Henry Samueli School of Engineering and Applied Science. 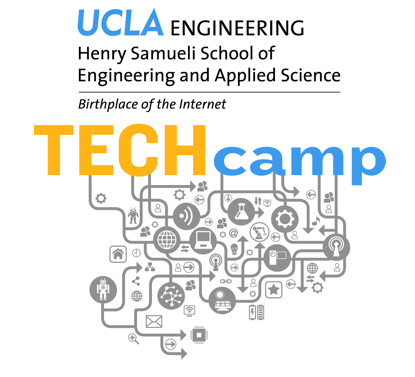 Get a taste of UCLA college-life as a participant in Tech Camp. Our unique approach to arts education brings elementary, middle and high school students, educators, families and the community to Inner-City Arts' award-winning campus—an oasis of creativity and learning in one of the nation's poorest neighborhoods—to work with professional teaching artists in well-equipped studios and performance spaces. All Inner-City Arts programs, taught by professional teaching artists, are designed to strengthen language development, develop critical thinking skills, promote literacy and improve learning outcomes overall. Most importantly, children and youth who participate in Inner-City Arts programs see themselves as capable of setting and reaching goals. Working individually, in pairs or small groups, students develop community-building skills including cooperation and patience, and gain verbal skills and confidence, as well as the capacity to trust their own creative instincts. Applications will be accepted February 18th through March 18th. The California State Summer School for the Arts is a rigorous, preprofessional, month-long training program in the visual and performing arts, creative writing, animation and film for talented artists of high school age. CSSSA provides a supportive environment in which students hone acquired skills and explore new techniques and ideas for an intense and exciting learning experience. The school was created by the California Legislature, and held its first session in 1987. Its purpose is to provide a training ground for future artists who wish to pursue careers in the arts and entertainment industries in California. The California State Summer School for the Arts is a state agency funded through a unique public-private partnership.